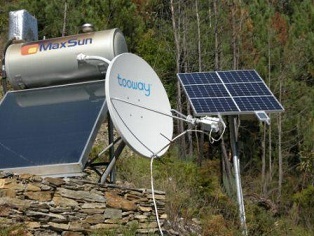 Tooway satellite broadband service in the Algarve, Portugal. Information for customer sites in Portugal, Western Spain and Gibraltar. 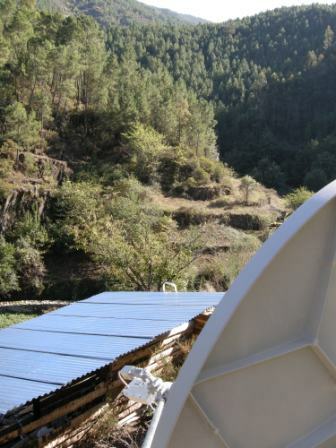 Picture of a Ku band TooWay dish in Portugal. Satellite internet connection is suitable if you can't get phone line broadband (ADSL) or mobile phone internet connection. Satellite Broadband Internet for homes and business is a last resort if faced with no terrestrial internet connection. The picture above and the one lower down are typical of potential customer locations. Nov 2014: The company "Broadband-Algarve.net" no longer appears to exist. I don't know the details. The company may have been taken over by "Simply Algarve" or "Europasat". I have no idea. If anyone knows please tell me eric@satsig.net and help update this page. Alcaria - Sistemas de Communicações Limitada, trading as Broadband Algarve, registered in Portugal 509 758 304. Meanwhile you may contact similar companies selling the european Ka band Tooway service; see page http://www.satsig.net/ivsat-europe.htm. There are a number of resellers of Tooway service. Various price packages exist to suit everyone's needs. Note: Total independence from terrestrial infrastructure - No telephone line required. Likely customers are homes and small/medium sized businesses unable to connect to the internet via ADSL or using mobile phone solutions. Satellite broadband for remote locations. The text and images on this page are based on information kindly provided by Broadband-Algarve. This page is for information only and is not a paid-for advertisement. It is not up to date. See above about possible takeovers and legacy contact details. Page started 6 November 2009, last amended 26 Mar 2019.